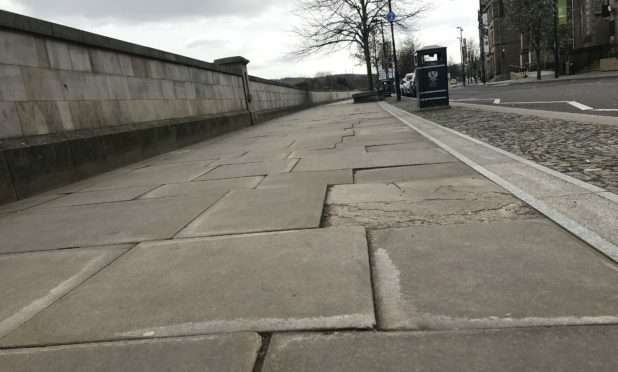 Council chiefs have been urged to spend a near £2 million windfall removing unsightly vegetation from city centre rooftops and fixing “dodgy” pavements. Perth and Kinross has been promised a substantial share of a £50m Town Centre Fund set up by the Scottish Government, in partnership with local government body Cosla, to give money to local authorities to “keep life” in their high streets. Heritage watchdog Perth Civic Trust has called for some of the money to be used for a much needed spruce-up of Fair City streets, including a crackdown on shrubbery sprouting from rundown buildings. Trust chairman David MacLehose said the local authority had demonstrated its ambition and commitment to improving Perth’s fortunes by bankrolling large-scale schemes such as the redevelopment of the City Hall, but it also had to take the reins on less glamorous work to maintain the fabric of the town. “Capital-funded culture-linked projects are key to attracting visitors, and their spending, to Perth,” he said. “These are long-term projects which are essential to the future prosperity of Perth. “Of equal importance, but seldom given sufficient priority, is the appearance of existing buildings in Perth and the centre’s essential infrastructure. Mr MacLehose said that many shops and residential properties were a “discredit to an aspiring tourist centre in the heart of Scotland”. He said the trust would back the council to part-fund improvements through innovative grants, for a limited time. The trust has also demanded the local authority takes action on chimney pot greenery. “Grants to assist owners to remove these damaging intruders would reassure owners to join forces with others to clean the skyline of Perth,” Mr MacLehose said. The trust is also calling for money to be spent tidying up “eyesore” riverbanks between the city’s Smeaton and Queen’s bridges. Earlier this month, the council was urged by local SNP MSP John Swinney to invest the money “wisely” in places such as Pitlochry, Blairgowrie and Aberfeldy.